FOOD TRIP - One of my favorite phrases when I was in college. I clearly remember the days when we would just go out and to a particular place and say those magic two words and we'd scour the mall, the street, or the area for any food stalls there and just buy, taste, and stuff ourselves with delicious goodies! It has somewhat become a therapeutic ritual especially after exams and the like. Now that I'm no longer studying, I still look for "food trip" times. So when Miss Genn D shared about IL MERCANTI, a food bazaar located at Metrowalk and invited me and a bunch of my other blogger friends to hang out and taste the fare there, I immediately jumped at the opportunity to do so! Nothing beats good old fashioned Food Tripping! I didn't care that it was raining! I had to go. Even in our excitement to go there, some of our church friends were also intrigued and came along with us! That's the beauty of a food trip -- enjoying food and fellowship with friends. Check out IL MERCANTI through the eyes of Brew of The Day! If I'm going to describe the place, I would say FOOD OVERLOAD. There were so many food stalls to choose from that I really had a hard time choosing where to eat! In my excitement, I started snapping photos before I met up with Miss Genn D and the gang. When you get there, the food stalls and the various aromas take over your senses. The place was set up in such a way that there were a group of tables for eating on both ends at the back of the tent so that most of the food were showcased in the middle and on the front side of the tent. Of course one of the SOP in FOOD TRIPS here in the Philippines is chowing down some of our famous and infamous street foods! Yes your favorite ihaw-ihaw (in English - grilled! ), turo-turo (point), and tusok-tusok (speared? haha I'm not sure about the correct English translation of that!) food can be bought at Il Mercanti Food Bazaar. I mean, seriously, this is a staple! No food trip should be without it. And that's where my dear cousin headed and had some yummy Chicken and Pork ISAW. Fans of this Filipino delicacy can choose from the various errr choices and my cousin swears its delicious! Don't know what ISAW is? Google it! I dare you! hahaha! Besides isaw, betamax, pork barbeque, and the like... foodies can buy other standard stuff that is grilled and you can choose it fresh and have it grilled right in front of you! Other stalls showcase raw fish, meat, and seafood -- this at a budget price of Php 100. Then we also had the traditional cooked Filipino dishes where they are either pre packed or still in its serving dishes and you can just from it. I know there is at least one stall there who offered THREE VIANDS for a Php 100! Wow for super busog food trip, that's definitely a steal! I think this is Lechon Kawali! Sign says Php 85 only! Then you have other choices of type of cuisine! Yes, so if you really wanna food trip, Il Mercanti is the place to be coz they have Korean, Japanese, Persian, American, and ala Italian style of dishes being served here! PIZZA anyone! May stuffed pa! Do you SEE how THICK that is? It smelled absolutely wonderful while it was being grilled! Right here at IL MERCANTI! The Med Chef Team - Chef Hasset Go with business partner Jayson Paul Carlos. I found out that the reason why they are called Med Chef is because Jayson happens to be a medical rep. So Med (Jayson Paul Carlos) and Chef (Hasset Go). The name is catchy and memorable! Wish I had taken a photo with them pero nahiya ako! haha! kasi nagulat naman ako at si Chef mismo andun! hihi! super big and yummy brownies! 3 for 100!!!! I think that's Almond brownies, Cheese brownies, Butterscotch brownies, and Pecan Brownies. I really had a super hard time choosing which three to take home coz I wanted to try em ALL! I asked Chef which was the best seller so that I will choose that amidst the rest. I ended up bringing home all 4 flavors! Yay thanks so much Chef! One of my favorites -- Cheese Brownies! Super sarap promise! And I like the texture and the size! Great for pasalubong (which I ended up doing) to your family and friends. Also am thinking that this would be great gifts for Christmas.. yumyum! Med Chef putting yummy finishing touches on one of the desserts! So many cakes to choose from! I didn't buy any cakes na.. hahaha.. I haven't even bought my main dish yet! Chicken Pesto Pasta with Garlic Bread at Php 60.
various pasta dishes so I will probably try a different stall next time. The pasta left me unsatisfied but I was determined to eat something a bit unusual or not readily available at other areas. Then I saw this! I've been craving for something like this for a while now.. I bought Fish Fingers n Chips! It had more servings.. hihi..
and tasted divine with the squeeze of lemon and ranch dressing! When the others tasted that, they suddenly wished they bought the same thing as I did! Yay, score a good one for me! At Php 135 with 4 pieces of fish, this was really a deal! Pwede for sharing pa! Fish n Chips Whole serving! So with that I immediately consumed my Php 300 budget! May Php 5 change pa! But I ended up buying a Gulaman drink at Php 25 so talagang simot ang budget. 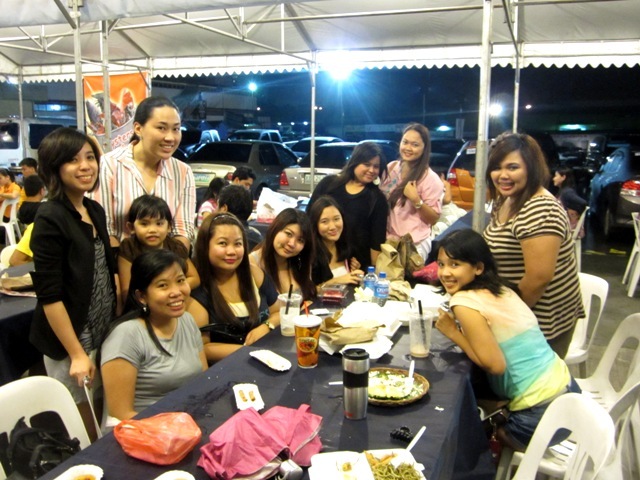 So here is now the FOOD TRIP IL MERCANTI barkada that night! 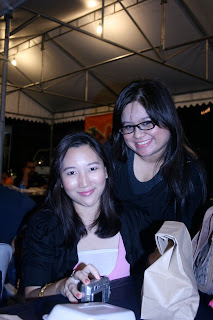 Bloggers, Friends, and with Miss Connie Sison herself! and what are we holding? Yay thanks so much Miss Connie Sison and Miss Genn D for this wonderful treat! I ended up buying another fish n chips set to take home to my parents! 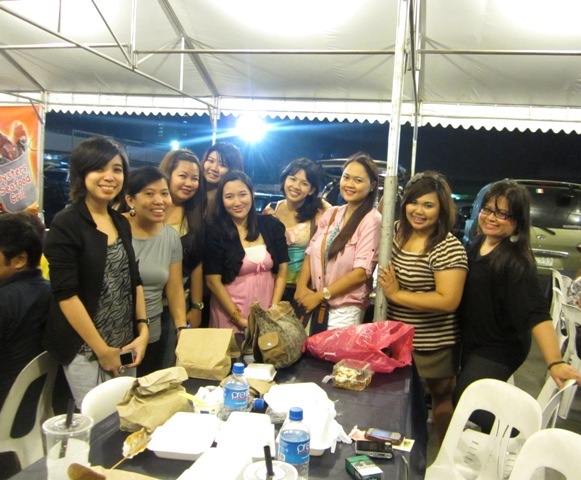 Fab Bloggers at Il Mercanti = Happy Food Trip! Barkada Bloggers having a Happy Food Trip at Il Mercanti! from WEDNESDAY to SATURDAY from 7 pm to 4 am. Happy eating!